From lifelong car enthusiast and photographer Mike Mueller comes the most expansive overview of Chrysler Corporation’s muscle cars ever published. It’s no secret that Dodge and Plymouth have been responsible for some of history’s most iconic muscle cars— a resume including the immortal Road Runner, Dodge Daytona, Hemi ’Cuda, Challenger T/A, Charger, Super Bee, Super Bird, and GTX. These cars, often referred to as “Mopars” (short for “Motor Parts,” Chrysler’s parts division), defined the golden age of the American muscle car. They earned the “Motor” part of the Mopar name by housing the most robust engines of the period: legendary power plants like the original Firepower Hemi, the Max Wedge, the 440 Super Commando, and the famed Street Hemi. Even their small V8s, like the 340 LA-series engine that powered the AAR ’Cuda, are the stuff of motorhead folklore. 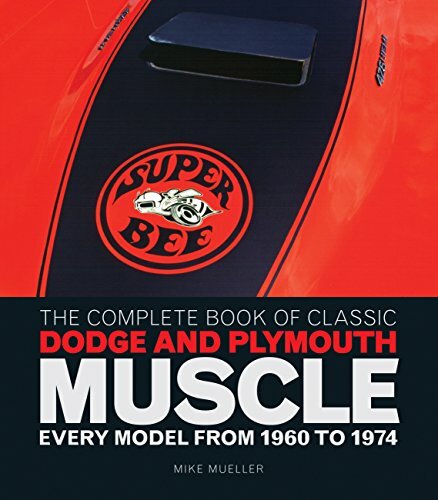 In The Complete Book of Classic Dodge and Plymouth Muscle, they’re all here: every car and every engine from the classic era. This gorgeously illustrated work takes readers through the fifty-plus-year history of Mopar performance, from the Hemi-powered 300 Series through the last cars produced before rising gas prices, tightened emissions, and outrageous insurance rates brought the curtain down on American muscle car production. Author/photographer Mike Mueller offers an in-depth look at the specialty driving machines that have made Mopar performance an enduring part of American automotive culture for over half a century. With extensive details, specs, and spectacular photographs, Mueller’s book stands alone as the ultimate resource on America’s muscle cars. If you have any questions about this product by Brand: Motorbooks, contact us by completing and submitting the form below. If you are looking for a specif part number, please include it with your message.